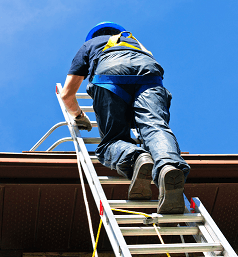 LADDER FALLS CAUSE MORE THAN 500,000+ INJURIES A YEAR IN THE U.S.
Did you know that every 2 days, on average, work-related ladder falls result in 1 death and more than 180 injuries, resulting in $24 billion a year in related costs, including work loss and expenses for medical, legal, liability, and pain/suffering, according to the National Institute for Occupational Safety and Health (NIOSH). Dr. Angela DiDomenico, Senior Biomechanist at ARCCA, was interviewed recently for an article on Ladder Safety that appeared in the March 13, 2017 issue of the BLR (Business and Legal Resources) OSHA Compliance Advisor Newsletter, where she opined on the role of human factors in ladder falls. Angela is an experienced expert in slip/trip/fall analysis, construction safety, human factors and ergonomics, and biomechanical and injury causation analysis. She specializes in investigating accidents involving workplace injuries, ladder safety, falls from scaffolding and the biomechanics of injury, and her work includes site and equipment inspections, applicable code compliance, testing, injury causation and tolerance analysis. To learn more about the causes of ladder failures and falls, read BLR’s full article – click here. To learn more about Angela or to contact her, click here.